Too many times you love something you purchased for a week or two and then you find out all the bad things about it. I waited four months to write this review. I can now say I highly recommend my hearing aids from Florida Medical Hearing Centers. This is my third set of hearing aids. The last pair cost over $3,300. The down and dirty is that they were awful. They would deafen you outside in the wind, a restaurant, or in a car. They were uncomfortable, big and unsightly. They barely helped in figuring out what people were saying. I can’t say enough bad things about them, I felt I had been ripped off. I wasn’t going to ever get another pair of hearing aids after the last $3,300 experience but I received a flyer in the mail for FMHC. They said I could get a hearing test and try a pair for a week, all for free. I walked out with a set in forty five minutes on the first visit. No uncomfortable making of molds and multiple visits, you leave with a working pair. Janine Snyder at Vero Beach was my technician and I highly recommend her. What have you got to lose? Look at all you can gain. If things don’t work out, return them, it costs you nothing. If you still don’t want to try, think of your spouse. I had cause to visit the Palatka office of Florida Medical Hearing Centers on January 15, 2016, due to the fact that I had damaged one of my hearing aids beyond repair. I was fully prepared and expecting to make a purchase. The Specialist administered a very thorough hearing evaluation. Upon completion of the test, I was advised that being a veteran, I could submit a “Loss & Damage” claim through the Veteran’s Administration and receive a replacement hearing aid at no cost to me. The Specialist even went so far as to make several phone calls to the VA on my behalf, to determine exactly what the claim process would entail. After spending nearly 2 hours ensuring that he had done everything within his power to assist me, my appointment was complete. I was not charged anything at all for this appointment and I was given a business card with the promise of any further assistance that I may need at no charge. I would highly recommend Florida Medical Hearing Centers to anyone, of any age, seeking assistance or guidance with hearing issues. Their care is very personalized and they will spend the time necessary to see to it that your needs are met. I worked around noisy equipment and it took it’s toll on my hearing. I went to “Brand X” and purchased 1 hearing aid, worn internally. It was very expensive and uncomfortable. After many visits and adjustments I was not able to wear it. The last time I took it back because it stopped working I was told the warranty of one year was up. It was just over one year old and would be very costly to send back to see if it could be repaired. Several years later my wife got tired of me saying “I didn’t hear you”. She saw an ad for FMHC in Vero Beach and made an appointment for me. I received my first real hearing test from Janine Snyder. She recommended what she thought I needed. After a few visits and adjustments I am totally satisfied with both of my hearing aids. It is so good to be able to hear again. I can’t give enough praise to Janine and her receptionist Melody Ingalls. Thanks to the great staff at FMHC. Approximately six weeks ago I gave into the knowledge that I needed help with my hearing. The thought left me feeling down but I knew I could not put this off any longer. I proceeded to make an appointment at the FMHC and was fortunate to meet Janine Snyder who would give me the care and guidance I needed. I was driven by a touch of vanity to want an inconspicuous device within the ear and my Hearing Specialist did her utmost to satisfy. After several visits and remake of the devices to assure my comfort, I was inclined to return the aids and suggested I come back at a later time to start the procedure again. However, Janine suggested I try an aid that she felt would give me the comfort I was looking for and ability to improve my hearing level and would also be inconspicuous. Thank you to all the staff and in particular to Janine Snyder who was determined to get it right for me. Miriam Valyo, Vero Beach, Fl. It is a sure thing, if you want the best care for your “hearing problems” then you have found the best in Florida Medical Hearing Centers. After twelve years, at last, I have found Janine. Janine is knowledgeable in the cleanings, adjustments, comfort and understanding; all that it takes to make the hearing aids a huge plus in your life. Today in Titusville our story begins, Norman Brisbin came in with his wife and daughter bragging about no longer needing to use his walker, Since he’s been wearing the Siemens Hearing aids. Norman’s fitting date was 01/30/15. Walking around without a walker has made him feel like a new man. When he first came to us on 01/23/15, using his walker and feeling dishearten and tired. NOT TODAY!!! He was alive with excitement and his wife noticed. Mildred, his wife is telling the stories of his progress throughout the week. Music to my ears hearing again, He quoted. “I can hear you now!” When Janine talked toward the wall and walked down the hall talking, I had to hold back the tears. I was so happy to be able to hear her speak. This is going to change my life in so many ways. Thank you so much…. 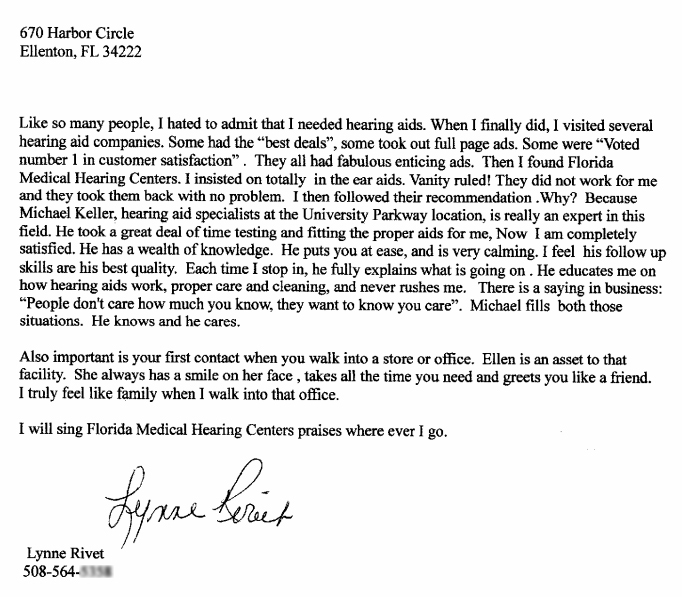 Believe me everyone I know will know about Florida Medical Hearing Aid Centers. That one phone call I made was a life change. Florida Medical Hearing Center’s gave me a free hearing exam and diagnosed my hearing loss professionally. The specialist then had a conversation with me and explained my options. I was nervous about wearing hearing aids at first, but when I was offered a 7-day free trial, I couldn’t say no. I’ll tell you what, by the time I got back home I was certain that these hearing aids were for me. The professionalism and free service are only half of what these guys do best, making you hear clear again is how they do it. I’ve been wearing hearing aids for many years now. When I had a problem with one of my hearing aids I decided to see a specialist at Florida Medical to get it repaired. When I arrived at the clinic the staff was very professional and attentive. The specialist examined my hearing aid, made a few adjustments and repairs and fixed my hearing aid. Best of all it was free!